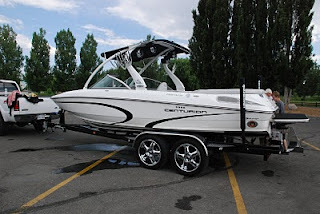 Utah Rent-A-Boat Wakeboard Boats, Ski boats, Fishing Boats, Jet Ski Rentals: Buy or Rent a Boat that is the question?? The real question is, how much will you use the boat??? Many people love the water and boating but their commitments, families, or jobs limit the time that can be spent on the water. If you are like our family (we live for the water) you try get to the lake at least two to three times a week, even if its only for a few hours. People who will get that much use out of a boat need to buy one. Most people however don't have that opportunity and are lucky to get out on the water 2 weekends a month, 3-5 months of the year. In this case it may be better to rent or charter a boat rather than buy one. Boating, as much as I love it, can be a very expensive hobby. Many new boat owners are surprised at all the costs attached to owning a boat. We joke all the time that Boat = Break out another thousand. It sounds funny but can be very true. When you first buy your boat there are always the costs of not only the boat but equipment as well. One can easily spend $2,000 to $3,500 minimum in life vests, ropes, anchors, wakeboards, water skis, tubes, trailer locks, travel boat covers, knee boards, wake surf boards and of course the list can go on and on. Pricing for a boat can be anywhere from $40,000 to $100,000 but if you are in the market for a boat right now, we are enjoying a great buyers market. If you are ready and determined to buy a boat now is the time. Loan interest, depreciation, maintenance, insurance, winter storage or shrink wrap; these are a few items to keep in mind. On a $60,000 dollar boat you can expect to pay $7800 in payments based on a 15 year note at around 7.50%. If you are financing the boat for less time, your monthly payments may be even more. You will spend $900 - $1500 for winter storage or $400 for Shrink Wrap (you need to protect your investment with proper storage). Insurance for the year will be up to $1,500 and of course maintenance on the boat, of which there will be plenty, can average around $1200 - $1500 per year at marine prices of over $100 dollars an hour. In this scenario we haven’t even figured in the depreciation on the boat. If this doesn't scare you away then let’s go shopping and find your dream boat. The Alternative to buying a boat is to rent or charter from a reputable service. TK Watersports has created a pretty good business trying to solve this issue for those who don't have the time, or sometimes the funds, for full boat ownership. For that same $60,000 dollar boat, you can rent 10 times for $5,500 or do full service water sports charters for around $7,500 including all equipment, water sports instruction, and all work done for you. Your savings in a three year period, not counting your depreciation cost, could be as much as $14,529-$20,529 depending on regular rental vs. VIP Watersports rentals. Again the real question is how much will you use the boat? If you run a boat like we do, you may be a great candidate for boat ownership. If you only will use it 15 times or less a year, you are better off renting or chartering without all the hassles of boat ownership.